Uptown Grill Blog: Graduation Parties:Let Us Help with Your Event! We know the next few weeks will be a busy time for area parents. It's getting down to the end of the school year, which for many, means time for graduation. This also means a lot of time planning graduation parties. We would like you to know we are here to help! While some families prepare for large get-togethers with large amounts of friends and family, others just have a few close relatives out for lunch or dinner to celebrate. Either way, we are here to help make things easier on you. Interested in planning your party here? We welcome all size groups. For those that celebrate on a smaller scale, we have the space in our main dining room to accommodate a table of your closest family and friends. Bringing the whole family? Our banquet room is a perfect, private place to accommodate these larger groups... a room all to yourselves to enjoy each others' company and revisit the memories on how fast your little one has grown up. Make it easy, let us do all of the work for you. No matter what, rain or shine. You have the comfort knowing it is all taken care of. You just have to show up and enjoy yourselves. Planning to invite family and friends over to your home or a local park? Remember, we can be a part of that, too. We have many different options to choose from. Let us finish off the spread with any one of our appetizers, sandwiches, pastas or salads that are available in large, attractive disposable catering trays. What party would be complete without some our crab rangoon? 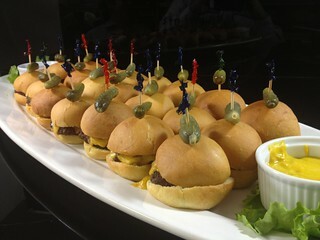 Or how about some 100% angus beef sliders? Most appetizers are available in 30-40 piece trays that we would have ready whenever you tell us you want it. These finishing touches are sure to please, and know one has to know you didn't make them yourself! Save yourself some time these next few weeks, and let us be a part of your event. All you should have to worry about is spending time with your graduate. Congratulations to all graduates! Click here for the full menu to choose from, or give us a call at 815.224.4545 and we would be happy to help plan your menu!